The Kushiro Wetland, the largest wetland in Japan, nurses variety of wildlife including Japanese cranes and provides its visitors with a sense of peace and the richness of nature. However, the wetland has suffered from various human disturbance in particularly the most recent decade, and the ecosystem there has been heavily stressed. Therefore, Ministry of the Environment (MOE) took initiative to restore the wetland ecosystem in conjunction with local nongoverment organization (NGOs), local goverments, and related ministries and agancies in 2002. This website introduces a nature restoration mothodology, "the Kushiro Approach," developed for this restoration project. 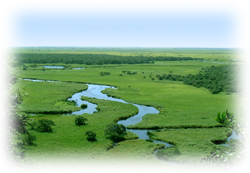 In addition, various topics related not only restoration, but wetland in gneral are offered. Choose the topic which you would like to check from the list on the left. Please be aware that the contents in English here is simplified compared to the original contents in Japanese. Without any special softwrare, you can enjoy the view of Kushiro Wetland in the 3-Dimensional world. There would be the issues such as the detail of landuse and geography, which you could not see on the simple map. Let's operate GIS to see Kushiro Wetland via World Wide Web. Various topics are ready to be seen with explanations to offer better understanding.